threerb has no other items for sale. Poly Bags 6" x 9"
Poly Bag 7.5" x 10.5"
Poly Bags 9" x 12"
Poly Bags 10" x 13"
Poly Bags 12" x 15.5"
There are 23,267 items available. Please enter a number less than or equal to 23,267. Sales tax may apply when shipping to: CA*(8.26%), CO*(6.47%), GA*(7.33%), IL*(6.25%), IN*(7.0%), IA*, KY*(6.0%), LA*(9.58%), ME*(5.5%), MD*(6.0%), MI(6.0%), MN*, NE*(5.86%), NV*(7.78%), NJ*(6.63%), NY*(8.5%), NC*(6.9%), ND*(5.51%), OK*(7.86%), PA*(6.0%), RI*(7.0%), SC*(7.36%), SD*(6.5%), UT*(6.75%), VT*(6.04%), WA*, WV*(6.0%), WI*(5.46%). 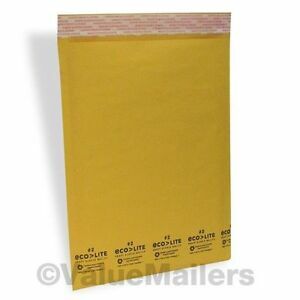 Ecolite bubble mailers are a good quality product. I have been purchasing them for years. The price is also right. They are very affordable. Great product I trust to mail everything from books to beanie babies. I have found these mailers to be of good quality at a reasonable price. Impressive sturdiness, sticky glue. Gives a little, but not overly flexible. Looks good. Love this envelope and size! Will reorder. Great quality and fits many items from books to jewelry. Highly recommend!